Now a new service for our City's taxpayer that would allow them to keep an on-line record of their tax payments to the city from as far back as 2011. 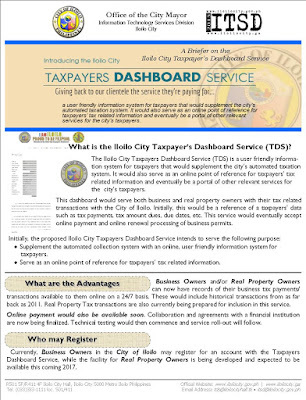 The Iloilo City Taxpayer's Dashboard Service (TDS) is a user friendly information system that would supplement the city's automated taxation system. It would also serve as an on-line point of reference of tax related information and would later be a portal of other relevant services for the city's taxpayers. Share this info with your friends who are business owners and residents of Iloilo City. Watch out for more information on this service within the week.